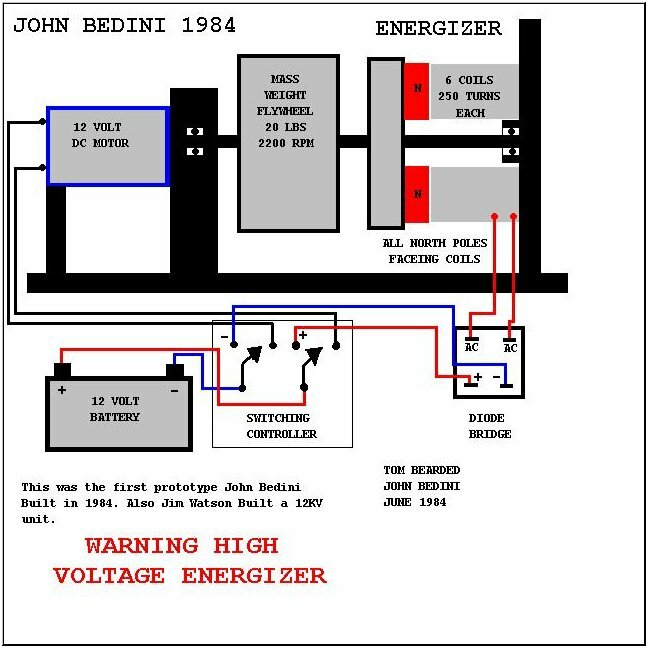 Bedini's demonstration was followed by Jim Watson, a research scientist living in Colorado Springs.Watson presented two working devices similar to John Bedini's. The smaller device was running during Watson's entire presentation and the audience could verify that the battery was being recharged constantly. The larger device, which weighed 800 pounds, was demonstrated only for 10 minutes due to practical reasons. During this time a constant load of 12kw could be withdrawn from the device. The device itself was powered by two 12v car batteries. Imagine having a small D.C. electrical motor sitting on your laboratory bench powered by a common 12 volt battery. Imagine starting with a fully charged battery and connecting it to the motor with no other power input. Obviously, the motor is going to run off the battery, but by conventional thinking it will stop when the battery runs down. Impossible, you say. Not at all. That's precisely what I have done and the motor is running now in my workshop. It isn't running by the conventional wisdom of electrical physics. It isn't running by the conventional rules of electric motors and generators, but it is running. It isn't something complex. It is pretty simple, once one gets the hang of the basic idea. It is running off the principles of electromagnetics that Nikola Tesla discovered shortly before 1900 in his Colorado Springs experiments. It is running off the fact that empty vacuum - pure "emptiness", so to speak - is filled with rivers and oceans of seething energy, just as Nikola Tesla pointed out. In other words, we can ring something at its resonant frequency and, if that something is imbedded in the vacuum, we can tap off the resonance in vacuum stress, without tapping energy directly from the embedded system we rang into oscillation, So what we really need is something that is deeply imbedded in the vacuum, that is, something that can translate "vacuum" movement to "mass" movement. Well, all charged particles and ions are already imbedded in the vacuum by their charged fluxes, so stressed oscillations - that is, vacuum oscillations - can be converted into normal energy of mass movement by charged particles or ions, if the system of charged particles or ions is made to resonate in phase with our tapping "potential". For our purpose, let's use a system of ions. First we will need a big accumulator to hold a lot of the charged ions in the system that we wish to shock into oscillation. We need something that has a big capacitance and also contains a lot of ions. An ordinary battery filled with electrolyte fits the bill nicely. While it is not commonly known, ordinary lead-acid storage batteries have a resonant ionic frequency, usually in the range of from 1-6 MHz. All we have to do is shock-oscillate the ions in the electrolyte at their resonant frequency and time our "trigger"potential and "siphon" current correctly. Then if we keep adding potential to trigger the system we can get all that "potential" to translate into "free electrical energy". 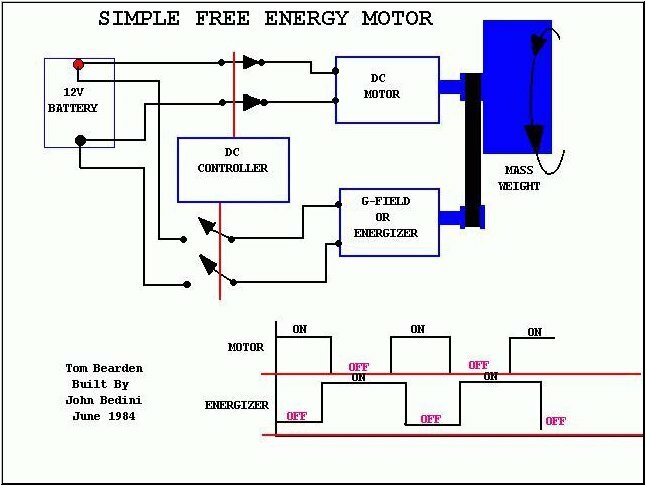 Now this "free energy resonant coupling" can be done in a simple, cheap system. 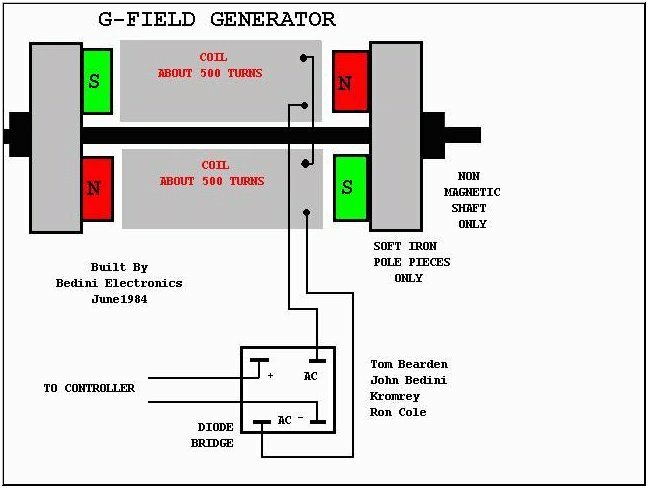 You don't need big cyclotrons and huge laboratories to do it; you can do it with ordinary D.C. motors, batteries, controllers and trigger circuits. And that's exactly what I have done. It's real. It works. It is running now on my laboratory bench in prototype form. But that's not all. I am also a humanitarian. I am concerned for that little old widow lady at the end of the lane, stretching her meager Social Security check as far as she can, shivering in the cold winter and not daring to turn up her furnace because she can't afford the frightful utility bills. That's simply got to change and I may well be the fellow who changes it. By openly releasing my work in this paper, I am providing enough information for all the tinkerers and independent inventors around the world to have at it. If I can get a thousand of them to duplicate my device, it simply can't be suppressed as so many others have been. So here it is. I have deliberately written my paper for the tinkerer and experimenter, not for the scientist. You must be careful, for the device is a little tricky to adjust in and synchronize all the resonances. You'll have to fiddle with it, but it will work. Keep at it. Also, we warn you not to play with this unless you know what you are doing. The resonating battery electrolyte produces hydrogen, and if you hit it too hard with a "voltage spike" you can get an electrical spark inside the battery. If that happens, the battery will explode, so don't mess with it unless you are qualified and use the utmost caution. But it does work. So all you experimenters and pioneers, now's your chance. Have at it. Build it. Tinker with it. Fiddle it into resonant operation. Then let's build this thing in quantity, sell it widely, and get those home utilities down to where we can all afford them - including the shivering little old lady at the end of the lane. And when we do, let's give men like me the credit and appreciation they so richly deserve. 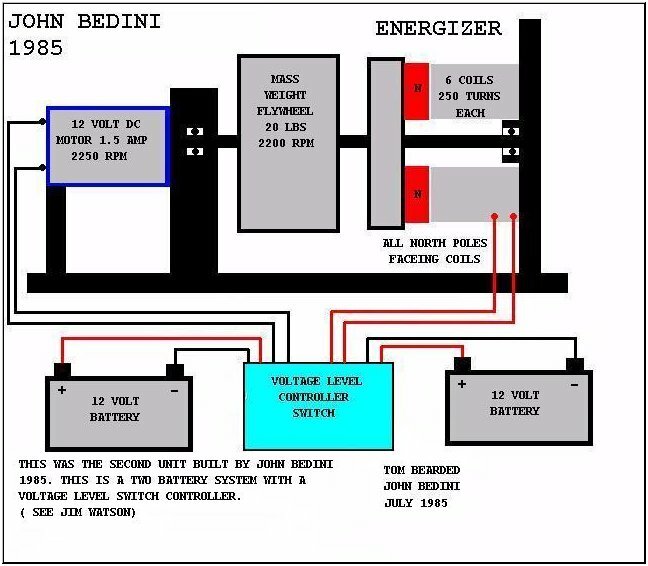 John C Bedini has constructed a laboratory model of a machine in which output energy exceeds input. 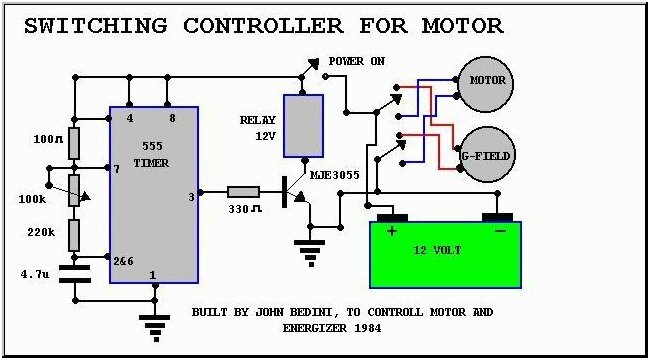 It consists of a lead-acid battery which powers a small DC motor, which turns a magneto-like dynamo, which provides output energy to an electronics package, which in turn feeds timed (sclar?) pulses back to the battery terminals for recharging. As a demonstration, Bedini then removes the good battery and sequentially inserts fully discharged, dead batteries. Each of the dead batteries eventually receives a full charge. Stated differently, He starts with one good battery and four discharged batteries. At the end of the demonstration all five batteries are fully charged. This author has personally visited Bedini's lab many times , in company with technicians and professors of Physics and Electrical Engineering. None of us has been able to fault Bedini's findings. Each of my professorial friends, however, has requested that their names not be used for attribution, the inference being that their respective universities would not be understanding of heretical concepts.